Rasterize layer while preserving colors created by blending with lower layers? 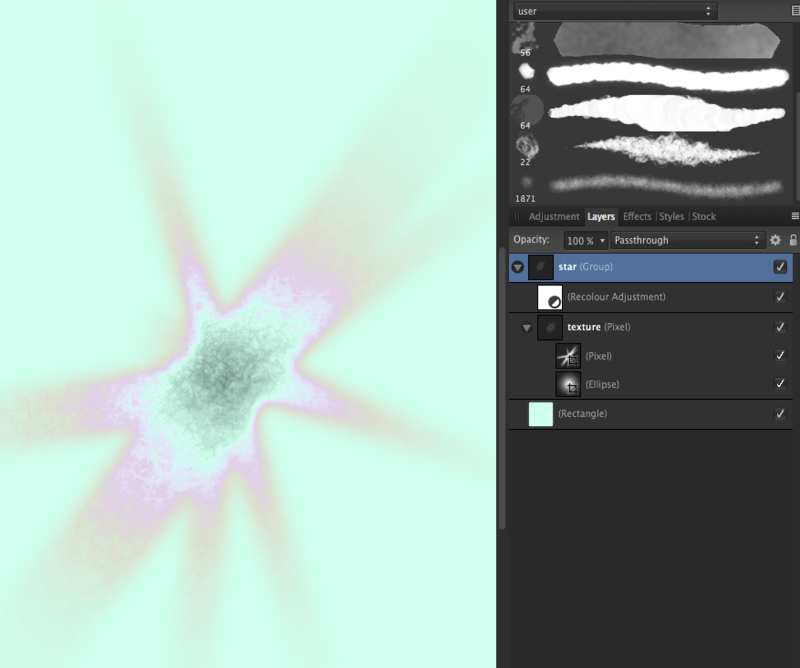 In pic 1 the "star" shape gets its rainbow colors from the interaction of the group's blend mode being set to passthrough and the embedded recolor adjustment layer's blend mode being set to negation. If I select the entire star group and choose rasterize the result is pic 2 - as you can see the colors created by the blending aren't preserved. I want to be able to take shapes with colors I create this way and rasterize them so I can place them on new backgrounds with the colors intact. Is there a way to do this? Thanks for any info, I run up against this a lot. I’m trying to follow what you did, and I’m a little lost on how to replicate it. What exactly did you do to create that design? The layers look different from the result. Here's the project file. It's a big file because the main image of the texture is huge but you can replicate the problem easily. Make a background layer with a color, make a square with a colored fill, change the blend mode of the square layer to any mode that substantially changes the color, then duplicate that square (so your two squares are overlapping, both with blend modes that are substantially modifying the color), then group the squares. Now select the group and choose rasterize. The rasterized image of the square will not retain the colors that resulted from the blend modes blending with the background. Changing the blend mode of the rasterized image to the same blend mode that was producing the colors before rasterization will also not replicate the same color, and even if it did, this wouldn't be possible for colors that were achieved by using multiple blend modes on different layers before rasterizing. It appears that the background layer and blend modes are what's supporting the recolor adjustment. If you hide the background layer, you get the same result as your second screenshot shows. Very tricky. Because normally, although adjustments can change the color of pixel layers, that does not include pixel brushes. The blend mode and the background colored object is what's exposing the color properties of the recolor adjustment. So instead, group everything, including the background layer, and then rasterize. So instead, group everything﻿, including the background layer, and then rasterize. Right you can do that but the point is to rasterize only the foreground shape so that you can impose it over other images without having to do a really really detailed mask. Sorry for the late reply. Honestly, I don't know how to go about it then, because there is a lot going on. 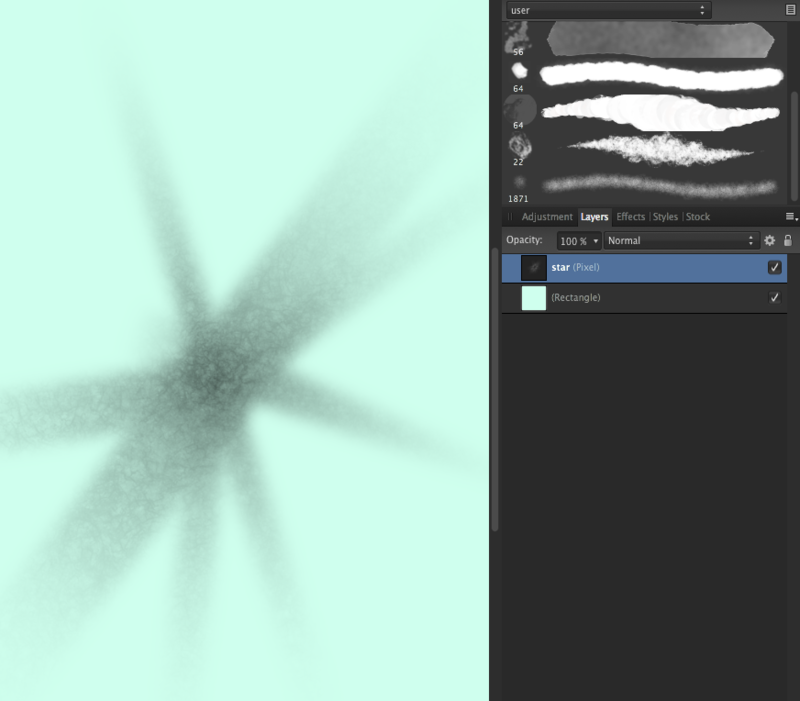 The background layer, the adjustment layer, and the blend mode are all working in a network. (They're all supporting each other). So by making a simple change, you get that black and white result, which you don't want. Hopefully, someone can give you a better answer, because I just don't know. This is a very clever approach, however. I figured out an easy way. You can merge visible, getting the shape with the right colors and the background as an image. Then you can take the original shape, use the "color overlay" effect to turn it solid black, rasterize that, and use that as a mask on the merge visible image. Thanks for the replies Bri-toon.